The Women's Conference is a power-packed day of workshops and sessions designed to energize and invigorate you — giving you new ideas and strategies to achieve and succeed according to your goals and standards. This conference offers a unique two-track format that lets you select from eight sessions — making it easy to jump from track to track and choose the workshops most relevant and important to you. In between, you'll have the opportunity to meet and network with other area professionals — contacts that will be valuable to you long after the conference has ended. This unique event brings nationally respected speakers together with the area's most talented professional women (including you!). Miss this day, and there's no telling how many opportunities will pass you by. Why a conference for women only? Many professional women find conferences and seminars designed for everyone leave critical questions unanswered and key problems unaddressed. 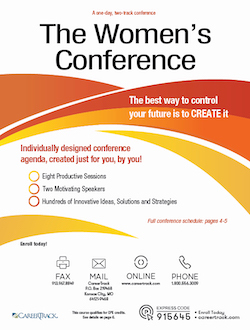 This conference won’t sidestep the important gender-related issues you face; you’ll learn strategies and techniques that are workable and comfortable for you. Just as important, you’ll be growing and learning with other professionals who have similar goals — influential women from your community you might otherwise never meet. Are people looking to you for leadership? Start by looking within yourself for the resources of the successful manager. Those facing the unique challenge of women in management will learn how to get stellar results from those you manage while developing a leadership style that commands respect and esteem. Motivate your staff members to give you their best. Learn to identify the strengths and weaknesses of your team. Handle management of friends, former peers and employees who are older than you. Develop your individual leadership style and enhance your personal power. Too much and too little? If you’re juggling too many projects and priorities in too little time with too few resources, this power-packed session is for you. Avoid the stress, burnout and chaos that result from overload and find innovative new ways to manage it. Take control of your time and work with the clock, not against it. Multiple tasks made easy — streamline your workday for greater efficiency. Adapt! Learn how to smooth out the bumps caused by changes, crises, delays and roadblocks. Eliminate the pressure and stress draining your energy and productivity. Your professional relationships are too valuable to be sabotaged by anger, stress or disappointment. This eye-opening session will help you keep control over your emotions and stay calm and level in the most highly charged situations. Learn relief strategies to sidestep emotional crisis and save your energy and passion for more productive pursuits. Break the bad habits that set emotions spinning. Halt festering conflicts before they have the chance to explode into damaging outbursts. Know the most effective responses for the emotional overreactions of others. Ever feel as if you’re losing the inner strength that got you where you are now? This exciting session is designed to help you tap into that inner calm that keeps you on track, focused and in control — regardless of the daily pressures you face. You’ll learn how to keep your composure and confidence all day, every day. Stand tall and assured in the most intimidating situations. Project an assertive, dignified image that commands respect. Discover seven secrets to get in control and stay there. Self-management: Develop a unique plan to help you manage and motivate yourself! Do you sometimes feel you’re too weak or too nice? Or, on the other end of the spectrum, do you come on too strong or become overbearing? Between the two extremes lies the secret to effective communication — an assertive style combining strength with sensitivity. Learn the how-to's of communication styles used by the world’s most effective, successful women. Say “no” without being negative or offensive. Enhance the way others perceive you and win increased respect and responsibility. Prevent others from manipulating you and stop the stress aggressive people can cause. Virtually no workplace is safe from those demanding, difficult people who frustrate and agitate us. You’ll learn specific steps and actions to take the offensive against these troublemakers and stop falling victim to their tactics. Pinpoint difficult types who target women and find out how to handle them. Learn to identify the six personality types of difficult people and get tips for dealing with each. Master communication tips that make the difference in specific situations. Counteract the negative influence of complainers and gripers. In today’s hurry-up, produce-more business environment, you need new ideas and survival skills to keep pace and stay on top of your job. If your to-do list never seems to get done, this session is for you! Discover how to gain control over your time and tasks, and get more done than you ever thought possible. Identify real priorities when everything seems urgent. Uncover (and eliminate!) hidden time-wasters that can devour your day. Meetings, paperwork, deadlines and requests: discover hidden shortcuts in your daily routine. Use power tips to get organized and stay organized even through crisis, chaos and overload! Stress is the insidious, omnipresent enemy of today’s professional woman; left unmanaged, it leads to burnout, fatigue, anxiety, even depression. You’ll learn how to avoid falling victim to stress and pressure with specific techniques to put the calm and control back in your life, whether it’s on the job or at home. Learn how to achieve balance at work and at home. Keep pace without burning out: coping strategies for high-pressure lifestyles. Relax and recapture your calm in virtually any situation or setting. Discover stress points unique to women and how other successful women conquer them.